Southern & Style: What's in My Makeup Bag? I love these kinds of posts because I'm also nosey, haha! I use that Urban Decay eyeshadow primer, and I absolutely love it too! I rarely line my eyes either (takes too much time in the mornings! ), but I have a great liquid liner from Mary Kay that I use when I go out. Love Too Faced products! Lovely roundup! I am also super nosey so I love to know what people are using for makeup, what they carry around with them and I also looove trying new products. And I especially love when they are drugstore. You should try the L'Oreal Paris Magic Skin BB Cream in the antiredness color! It is holy grail! It will literally change your life. Love that Vera Bradley bag! I've been wanting to get my hands on the Jaclyn Hill Eyeshadow palette! What a cute makeup bag! 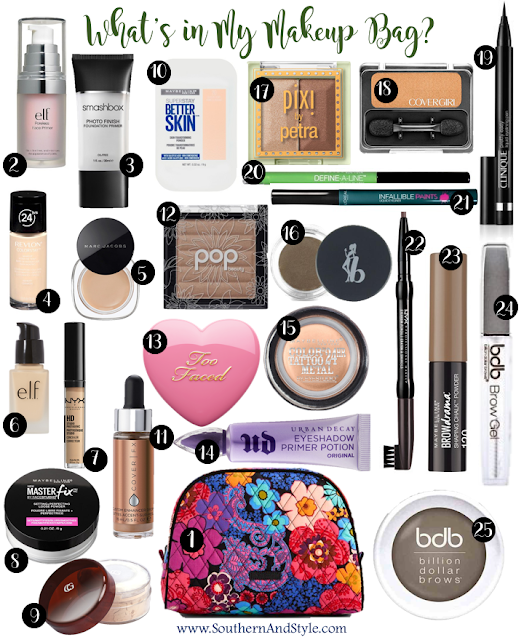 I haven't tried most of these products - I'll need to check them out once my current stash of makeup runs out! 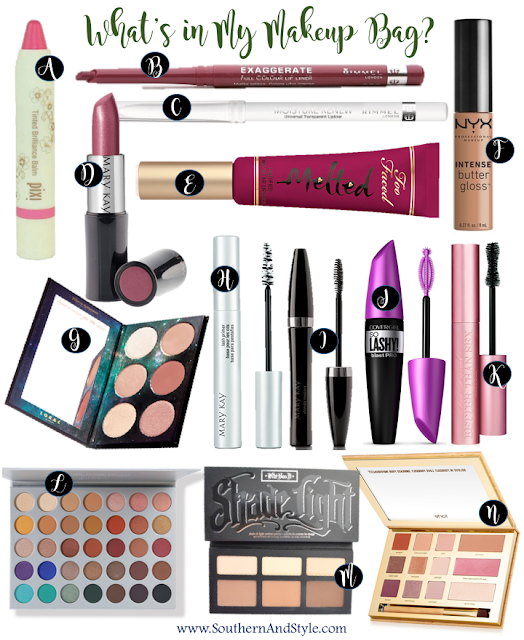 Love reading about all of these products! I've heard that eyeshadow primer rocks! I love all the products you use! What a great collection you have! Everyone keeps talking about the smashbox primer. I haven't wanted to spend that much money on a primer,but it might be worth the hype. So many awesome products! I use elf's face primer and Urban Decay eye shadow primer. Trying out new makeup is so much fun. I love the NYX eyebrow pencil! I love the brush to really blend out harsh eyebrow strokes! so many good finds here!